Home>Blog>Is It Safe To Use CBD While Pregnant? It is well-documented that certain cannabinoids work to remedy a plethora of symptoms, many of which are associated with pregnancy. Is it safe to use CBD while pregnant, or should all cannabinoids be avoided during this critical period? It is the complex physiological system known as the endocannabinoid system that regulates many functions and rhythms of the human body through homeostasis. It is also the system that the body uses to build brain pathways and neurons in the postnatal baby. The endocannabinoid system (ECS) was named after the cannabinoids found in cannabis that lead to its discovery. This system has evolved to respond to the endogenous cannabinoids found within the human body. This means that cannabis can be used as an effective tool for regulating mood, appetite, pain, and levels of inflammation in the body—many of the symptoms associated with pregnancy. Certain cannabinoids may risk disrupting a foetus’ brain development through interference with the ECS. Tetrahydrocannabinol (THC), a psychoactive chemical compound found in cannabis, is the primary concern. Studies show that THC can interrupt the formation of neuronal networks and result in nervous system-related birth defects. Post-birth evidence is still lacking, but there are still long-term concerns over the effects of THC on a developing baby. Many mainstream physicians may advise avoiding cannabis during pregnancy, although there still appear to be few risks associated with low doses of weed consumed in conventional ways—much in the same way as drinking small amounts of alcohol. 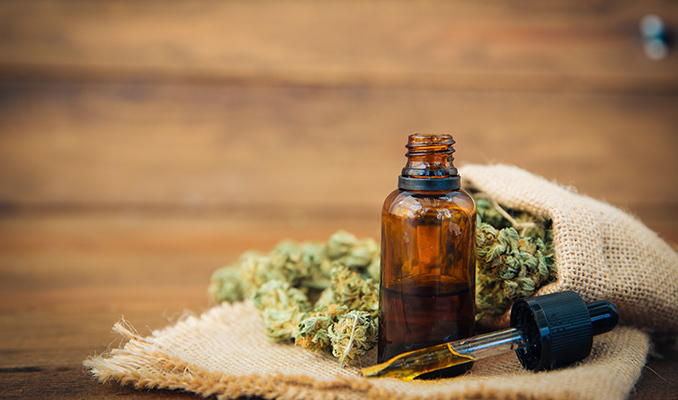 CBD is legal to purchase just about everywhere because it does not produce any psychoactive effects, but is still able to reduce inflammation, ease pain, and treat nausea and sleeping disorders, among other benefits. CBD can be purchased in the form of oils, lotions, and capsules made from pure hemp extracts. Many oils do contain trace amounts of THC in order to maintain the “entourage effect”, the theory that different cannabis constituents work in synergy with one another. However, these amounts of THC are negligible and will not produce a high. If you’re pregnant and live in a locale where cannabis is legal to purchase, it is a good idea to avoid “CBD-rich oils” that may contain greater amounts of THC than just “CBD oils”. CBD functions differently from THC. This has lead researchers to wonder, is it safe to use CBD products while pregnant? Unlike THC, CBD is non-psychoactive, meaning that it does not get you “high” in the same way as THC. CBD’s appeal is medicinal. It functions as a painkiller, reduces inflammation, fights nausea, and could potentially treat mood and appetite disorders. CBD has also been used effectively as a treatment for arthritis, epilepsy, and has been linked to fighting cancer-causing cells in the body. All of these characteristics make CBD the perfect natural alternative to synthetic drugs, especially for pregnant women. HOW CAN CBD HELP TO RELIEVE THE PAIN OF PREGNANCY? Cannabinoids are known to exert profound relaxant effects on smooth muscle systems. CBD has particularly comparable effects to oxytocin-antagonist drugs such as atosiban, which is used to lessen the painful effects of contractions during labour. A study conducted using synthetic CBD in 2010 showed reduced oxytocin-induced myometrial (uterine) contractions in cells cultured outside of the body. In other words, it was able to ease the level of contractions women have while giving birth. When supporting the weight of a new life, various areas of the body are placed under great strain and tension as the stages of pregnancy progress. The breasts begin to swell, putting extra weight on the shoulders, and the uterus begins to exert pressure on the pelvic-floor, causing pain in the legs, feet, and lower back. CBD is able to stop cycles of inflammation by soothing muscle systems, nerves, and pain receptors. It also has very few symptoms when applied as a topical. CBD oil is able to activate the neurotransmitter 5-hydroxytryptamine, which helps the body to slow the rate of expulsion reflexes in pregnant women, allowing for significantly decreased symptoms of morning sickness. CBD assists in activating serotonergic signalling using the 5-HT1A receptor defense mechanism. This process assists in activating the “feel good” chemicals in the body, which are effective in fighting off depression and feelings of anxiety. It has been noted in a report by the National Institution of Health that breastfeeding while using cannabis is outweighed by the risk of not breastfeeding, although the effects of any THC were still considered a risk to long-term development. CBD oil is often regarded as one of the safest options when choosing medicine that is free of potentially harmful compounds. Pregnant women have probably been using cannabis to treat their symptoms for far longer than we can imagine, but it is always essential to put the health of yourself and your unborn child above any danger. CBD products are becoming more widely recognised as a safe option, but there is currently very little professional advice given on its use during pregnancy; however, many prescription antiemetics can also be unsafe for your baby. If you wish to use CBD during your pregnancy and are concerned about the levels of THC, make sure to purchase CBD products from highly rated, reputable businesses that list the exact amount of THC contained, even if it’s in trace amounts.